Pupils at Bentley High Street Primary School were visited by a team member from Everything Dinosaur recently as Year 1 and Year 2 were studying all things dinosaur for their autumn term Key Stage One topic. The children were very knowledgeable and clearly the subject had been a big success with the school boasting a number of young palaeontologists under the tutelage of the enthusiastic teaching team. The Year 1 pupils, two classes 1H and 1G, had lots of examples of their writing, posters and artwork on display in the classrooms. 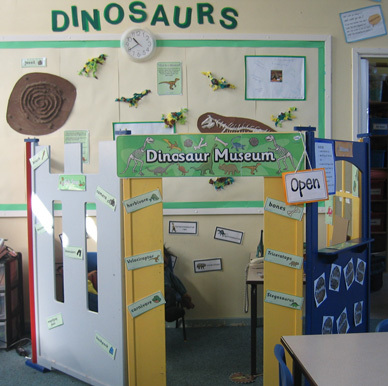 Mrs Gallacher’s class (1G) had set up their very own dinosaur museum, full of examples of the work that the children had been doing over the course of the term. The teaching team had carefully posted up a number of key words and phrases to do with dinosaurs and fossils. For example, words such as carnivore and herbivore can be explained using dinosaurs such as T. rex and Triceratops respectively. This ties in nicely with the parameters of the Key Stage One science syllabus learning about animals and habitats. There were examples of the children’s work, how data can be handled and some applied maths on display all allied to the teaching aims and objectives for children in Year 1 (aged from 5-6). One of the dinosaur pictures on display within 1G’s classroom was nicknamed “Tissue-oh-saurus” in reference to the clever use of tissue paper to make the bones that represented the skeleton. Our team members have made simple illustrations such as this and they are great as a teaching aid when helping children to remember parts of the body. Prehistoric animals and fossils as a term topic can lend itself to all sorts of activities, not only creative illustrations such as this but also the subject can encourage children with their writing skills and sentence construction. For example, Miss Headley and class 1H had been studying a storybook about dinosaur poo, there was some fossil poo (coprolite) in one of the boxes that Everything Dinosaur had brought into the school, so in the afternoon whilst Year 2 were treated to a dinosaur workshop, Miss Headley took the fossil into her classroom and showed it to the children. No doubt she inspired her class to make up some wonderful stories about prehistoric animals. The Year 2 teachers Miss Stafford and Miss Morley, aided by their hard-working support staff had got lots of examples of the children’s work posted up around the classrooms and in the adjacent corridor. Paper plates had been used to help some of the Year 2 pupils make dinosaurs and the children were fascinated to learn that actually there was a dinosaur called Plateosaurus. To check learning, a Plateosaurus fact sheet written by Everything Dinosaur’s experts and drawing materials featuring Plateosaurus was emailed to the school with the challenge for the children to see if they could work out whether Plateosaurus was a herbivore or a carnivore. Dinosaurs made from plates, a wall display featuring Plateosaurus! Part of the back wall in 2S’s class displayed a wonderful dinosaur diorama. Interspersed between the various prehistoric animals were smaller drawings done by individual children. The display was very bright and cheerful with the big teeth of a Tyrannosaurus rex carefully included in the artwork. Wonderful, colourful dinosaurs, a bright red Ankylosaur, a purple Stegosaurus and looking down on the scene a lovely blue coloured Sauropod whilst in the background a volcano erupts. The children asked about how the dinosaurs became extinct and we touched upon the relationship between dinosaurs and birds. There was even a question asked about how dinosaurs go to sleep. We tried our best to answer all the questions from the eager young dinosaur fans (even answered one or two questions posed by the HLTAs and LSAs as well).